We all receive visions, but we are not always obedient to them. Often our lack of obedience is caused by ignorance or by failure to realize that the vision is a leading, guiding intelligence. By visions I mean something more than one would see in a special opening of the invisible realms. Every high aspiration, every splendid dream that we have of our possibilities—what we should like to be—is a vision. But most of our visions seem so far removed from our everyday life that we do not give them substance, we do not give them a chance, because we are not obedient "unto the heavenly vision." Obedience comes through spiritual inspiration. Man must make himself obedient. In other words, it is necessary for him to covenant with the Lord that he will be obedient. He does that in Spirit, in his meditations, in his prayers. All of us have had visions; we have had waking visions and sleeping visions. We have seen things that we could not tell to others, for fear that they would ridicule us. 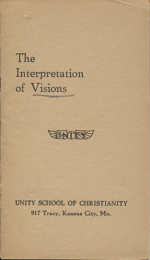 The visions that we have seen are from the Lord, and if we acknowledge those occult, hidden things as being real, and in the silent recesses of our souls become obedient, we shall get something more definite; this in turn will lead to a clearer revelation, and soon we shall have the door open between us and our higher selves. One of the most delicate subjects that the metaphysician has to deal with is that of visions and dreams. The practical, everyday man considers them foolish, childish, and valueless. Many religionists put a like estimate on these seemingly meaningless mental pictures. Even those who have a certain faith in visions and dreams are largely in darkness as to their real import. The reason for all this is that the realm in which these forces operate is so far removed from material consciousness that it is difficult to get a right interpretation or a right understanding of the symbols. Spirit functions in a consciousness in which there is no limitation. It is not a place of things; it is a place of ideas. In order to connect or synchronize with the world of effects, these ideas have to be transposed, changed about entirely. If you take your dream to be what it seems literally, you will fail to understand the message. Spirit talks in ideas, which are presented to man's consciousness as shapes and forms. So when you have the vision or the dream, remember that it is through understanding its abstract or absolute character that you will get the lesson and the right interpretation. If you dream of people or of things, and think that the dreams mean the people and the things themselves, you are not interpreting scientifically. Men become prophets and seers by seeking to know the meaning of the pictures of the mind. Anybody can dream dreams, but it takes a Joseph to interpret them. Joseph's supremacy over the magicians of Pharoah was in his ability to interpret dreams. He claimed that God gave him the meaning. 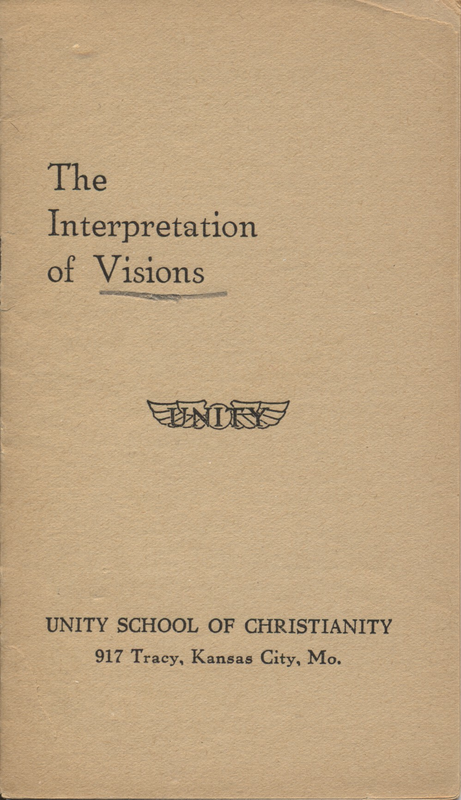 Does any one know of a theological college where the interpretation of dreams and visions is taught? The textbook used, the Bible, is running over with the teachings of those who have received their inspirations in visions and dreams. Today there are thousands of Bible students studying the dreams and visions that Daniel had, and yet, if you should say to one of those same students, "Do you ever have dreams?" he would probably reply, "Oh! yes; I have dreams, and I see things sometimes, but it is all my imagination." The visions and dreams of the old prophets were evidently of vast import to them, and they were undoubtedly prophecies of the race and what was coming. But the vital issue is to the individual. To what extent is he interpreting the visions and dreams that the Lord is giving to him? Man grows spiritually from the higher ideas that are projected into his intellectual consciousness, and his growth will depend largely upon his receptivity to the vision, to the dream, to the ideal. In the Bible there is evidence of an inner and an outer interpretation and relation of a vision. It is plain that what is called Peter's vision was partly a dream. The narrative says that he fell into a trance. He went into what we call the silence; he was meditating and praying on the housetop. When you meditate and pray, you look toward the realm of the spiritual—not with your eyes, but with your mind—and through this looking, directing your attention to the spiritual, it begins to open to you. It always follows that those who look spiritually, who pray, who believe in spiritual things, have added to them this other faculty, a spiritual imagination. The fact is that we are using this imagination all the time. It is the maker in us of forms and shapes. In contour, your body is the result of your imagina- tion. So, every time you look into the glass, you can see yourself as you ap- pear, or seem to be in your mind. Cultivate imagination; be true to the heavenly vision. Picture in your mind continually that which you want to be, and refuse to judge according to appearances. The sheet that was let down before Peter was filled with all manner of four- footed animals, creeping things of the earth, reptiles, and birds of the air. Certain people who would like to perpetuate the killing of animals and the eating of their corpses, tell us that this was a direct command given to Peter to kill and to eat animals. If this be true, then the lean kine and the fat kine that Joseph said represented years of plenty and years of famine, were real and not representative. If it is to be taken as a literal command to eat animals, then we should be eating all the quadrupeds— elephants, camels, skunks, dogs, cats, rats, and mice; we should be eating every four-footed animal, because the Scripture says they were all there—every one of them; we should be eating all the reptiles, the snakes, the centipedes, the tarantulas—every kind of reptile; we should be eating all the birds of the air—eagles and buzzards and owls. We know that this is not compatible with a good diet, consequently it is not to be taken literally but symbolically. Peter himself explains the vision. When he and Cornelius came together in Caesarea, they had a conference, and Peter said to him, "Ye . . . know how it is an unlawful thing for a man that is a Jew to join himself or come unto one of another nation [that is, a Gentile]; and yet unto me hath God showed that I should not call any man common or unclean." "I perceive that God is no respecter of persons." So, you see that he interpreted the dream, or vision, correctly; he did not take it in its literal sense at all. But to the Gentile, Cornelius, there came a direct command to do a certain thing. "Send men to Joppa, and fetch one Simon, who is surnamed Peter; he lodgeth with one Simon a tanner, whose house is by the sea side." This command was obeyed. Some of our dreams pertain to the individual, and others to matters external. It is difficult sometimes to decide just where to place the dream. I find that my greatest difficulty in interpreting is to know whether the dream applies to me individually or to me as an individual related to people and to things. I remember that a good many years ago, when Spirit first began to lead me in dreams, I had some very definite lessons and guidance in things external, in addition to my individual development. One night I dreamed that I went into the bank where we were doing business, and as I talked to the teller, I saw that his clothes grew shabby; I looked over to where the cashier was sitting, and his desk began to look worm-eaten, and everything grew less and less prosperous in appearance, and all at once the place faded away. I did not pay much attention to the dream. I was very busy at the time. I did not attempt to interpret it. After one has had a dream, he should meditate about that matter and pray, and ask for the interpretation. Spirit will show him. But I did not give any special attention to that dream, and a few nights later I dreamed that I was standing in front of the office. In the dream I saw a large bank of dirt come flying through the air; it landed with a great crash right in front of me, and out of it came a voice saying: "Now do you understand?" I thought that that was strange, but still I did not understand, and did not stop to inquire. In about three days after the last dream, the bank failed, and we lost all the money we had. Then I saw the warning that Spirit had twice tried to give me. On awakening after a dream, lie perfectly still and let the various incidents drift through your mind; then see whether you cannot connect some of them with some matter or question that you have been considering. Reduce the dream pictures to representative factors, and you will have the key to the interpretation. Joseph was a dreamer and an interpreter of dreams; his symbols were sometimes of the most ordinary character. The incredulous tell us that the things which the Lord gives us in dreams and visions are so trivial and childish that they cannot believe that they have any special importance or spiritual significance. But you will find in the Scriptures that the most common things were used to give the lesson. Study the dreams of Joseph and Daniel, and see how commonplace the symbols were. Pharaoh dreamed that seven fat cattle were devoured by seven lean cattle; that seven full ears of corn were devoured by seven thin ears. Joseph told the king that these simple things represented seven years of plenty to be followed by seven years of famine. That was the true interpretation, as the succeeding years proved, and not only Egypt, but Canaan, and the family of Joseph, were all saved by this simple dream. Caleb's oldier saw in a dream a common barley loaf. Caleb heard of the dream; he saw an inner meaning, and through it the Lord showed him how to overcome the great Philistine army with a few lamps and some sheep horns. So you can see how, by taking advantage of these simple lessons, these ordinary dreams that you have, you may get a guidance of importance to you. The Lord uses the simplest things to confound the mighty. Visions and dreams are from the Lord more often than we think; but they need a right interpretation. The mind of man is a very complex thing. We have many minds, or states of consciousness. The man who lives in the outer world knows very little about himself. He knows a certain external state of consciousness, or what he calls his mind. This is a very small part of the whole man. There is a realm that lives in ideas, which is the spiritual man. This inner realm has but little chance to express itself when the eye is wholly occupied with the world of things. When you go to sleep, you simply quiet the outer consciousness. When the body enters into its rest, the external mind rests also. Then the mind of Spirit has its opportunity, and in your dreams you get its wisdom. But if you ignore the spiritual mind and fail to inquire into its symbolical messages, it loses all hope of expressing itself, and mortality reigns supreme. Among men and women there is a growing faith in dreams and visions. The day is at hand when old men shall dream dreams, and young men shall have visions. On every hand our philosophers tell us that we must have imagination. We must see farther than we can demonstrate. We must look ahead; we must enlarge our capacity, through believing in the great possibility; then we shall attain it. You must have a large vision of yourself. The simplest process of your organism can be accelerated and strengthened and increased through a larger vision of its capacity. If you direct your attention into your stomach, and believe that it is strong and vigorous, it will do better work for you. No matter what the function is, what part of your consciousness lacks force or power or capacity, imagine and believe that it has great capacity and power, and it will express what you have idealized. Then let us believe in our visions and dreams. We should not let anybody ridi- cule us into ignoring these messages from God. The angel that appeared to Cornelius was a mind angel. The angel that appeared to Abraham was a mind angel. God does not make His angels material. God is mind; His thoughts, or angels, are ideas. All people have visions and dreams, but there is lack of God interpretation. Nearly all people interpret from the standpoint of form and shape. They take the symbols for what they seem, and fail to see the ideas back of the symbols. Joseph said that his dreams and visions were interpreted by God; all who go to the Lord for the interpretation get a lesson entirely different from that given to those who leave out the Deity. The dreamer who interprets in the name of the Lord gets a different lesson, and he is growing and developing in an entirely different direction from the one who functions wholly in the intellect. If you have the absolute, if you have God in your dreams and visions, then you are safe; but if you give yourself up to occultism, to spiritualism, to any realm from which God is excluded by your consciousness, it is not safe for you to pay attention to visions and dreams. Last week end my husband was in the back yard looking at a path a storm had come through in the woods behind our house. He had a vision of a black iron gate hanging on one post in the woods. He came inside to get me and said come here remember the storm the other night ? Come see the path it cut in the woods behind the house. I followed him out and saw where the trees were blown down and the palms were layed down. At this point he didn't say anything to me about his vision, I thought it kind of strange he showed so much interest in the storm path but said nothing.. It was two days later he told me of the vision, he said something had happened that scared him and explained to me as he noticed the storm damage a black wrought iron gate on one post appeared. That was why he came in to get me thinking that I would see it also but I didn't see it. He's been out there two days looking for this gate but hasn't seen it again... Is someone or something trying to tell him something? This is the first time he's experienced a Vision..